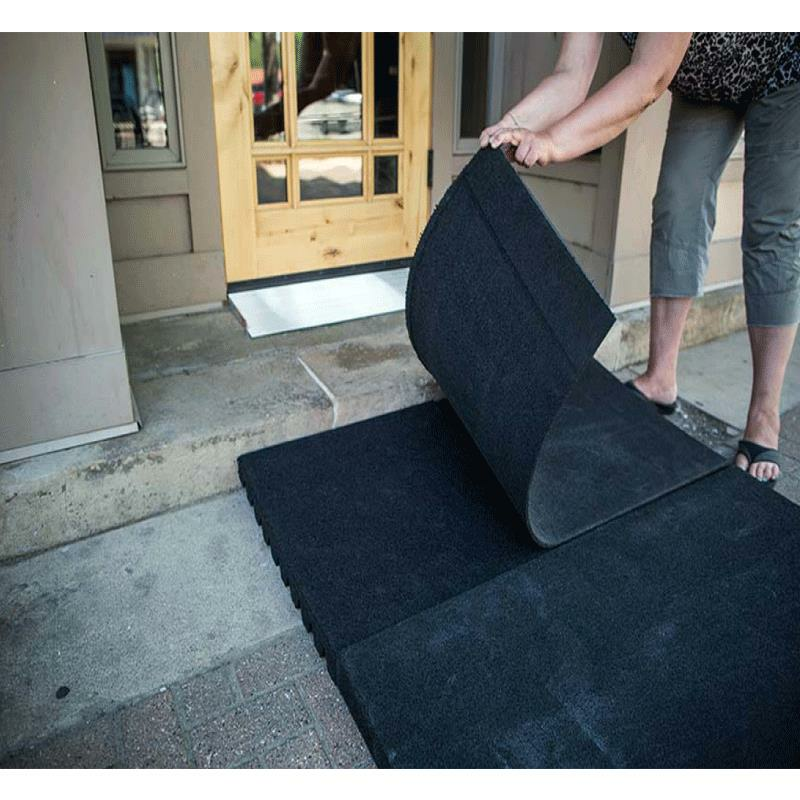 Ez-Access Transitions Modular Entry Mat is a portable rubber threshold mat which is made of 100% recycled rubber and can easily be trimmed or notched to fit various entryway heights. It can be transported from one location to the next, and creates a smooth transition. Transitions Modular Entry Mat can be used for exits and entries, both indoors and outdoors, to meet a variety of needs. - Rated load is 850 pounds. Never exceed rated load. - Read and follow all labels, instructions, safety and maintenance information before use. - Do not use if ramp is damaged or unstable. For wheelchairs and scooters only (not intended for commercial use). - Ramp may be slippery when wet or icy. Use only if sufficient maneuvering room is available at both ends of the ramp to assure safe travel when entering and exiting the ramp. - Use ramp only with a qualified helper and always use your lap belt. It is important that you refer to your equipment (wheelchair or scooter) User Guide for the proper degree of incline or decline and chair direction before attempting ramp use. Never exceed its recommendations. - The mat can be easily trimmed to accommodate lower heights and narrower widths and, if necessary, notched to suit the doorjamb configuration. 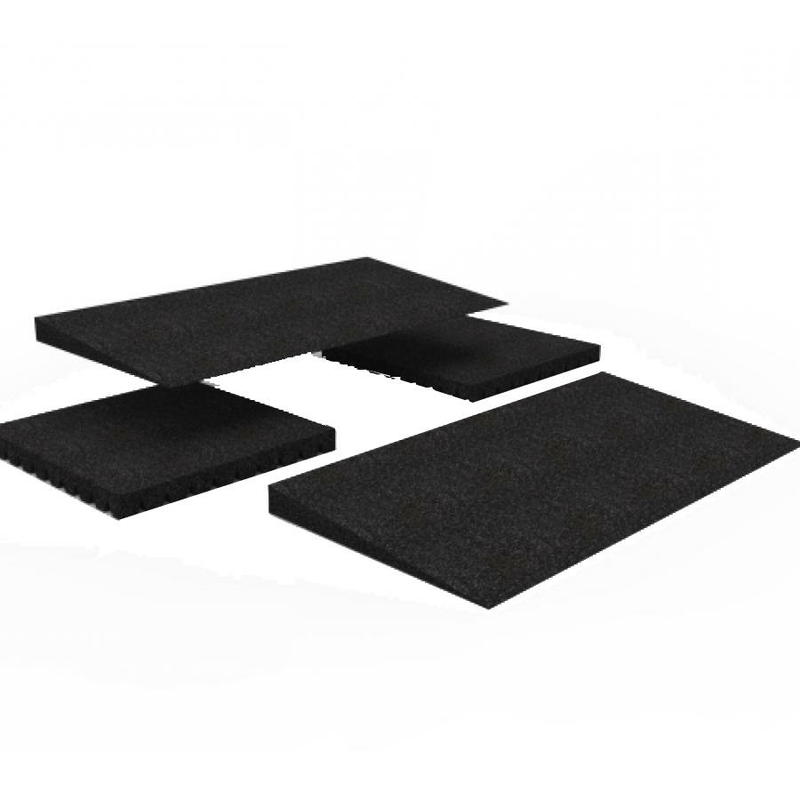 - Alternately, mat can be combined with an additional Modular Entry Mat and one set of Risers to create a maximum height of 4-3/4". - If door threshold is less than the height of the Modular Entry Mat (2-1/2" high), trim mat to the desired height, depth and/or width using a reciprocating saw, razor knife, or hand saw. - Use caution when operating any non-manual saw as serious injury may result due to unexpected binding or pinching of rubber mat material. Always follow tool manufacturers safety guidelines. 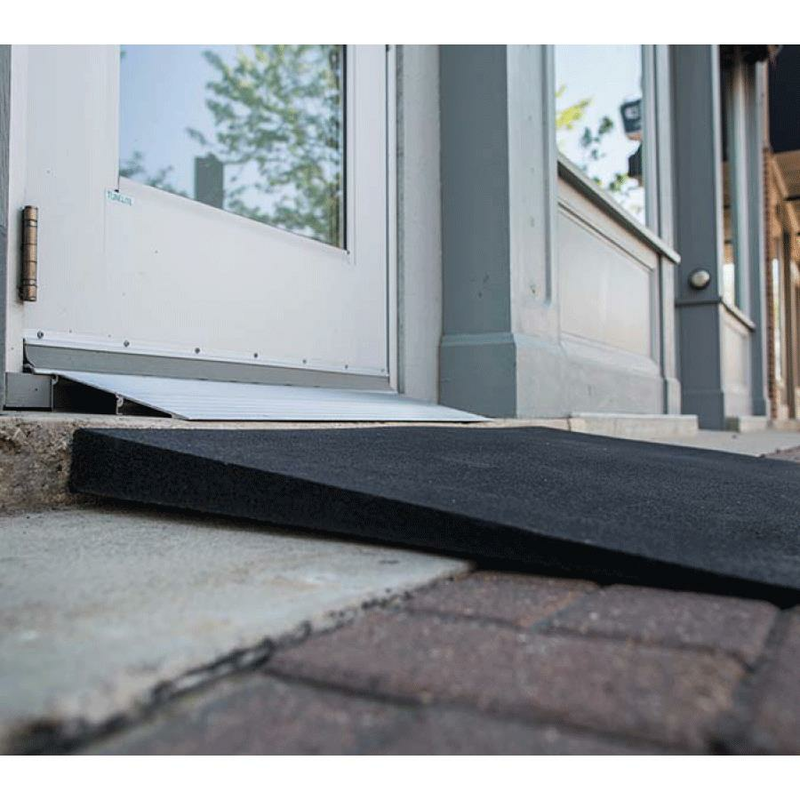 - If door threshold is greater than the height of the Modular Entry Mat (2-1/2" high), two Modular Entry Mats along with one pair of risers can be combined to accommodate a rise up to 4-3/4" high. Secure mat using supplied Phillips head screws (2 each). Space screws evenly and drive until head is 1/4" below the mat surface. Place mat in desired location and ensure that surface is free of dirt and debris. Using a 1/4" diameter masonry bit, drill a hole 2" deep 1" from the corner edges at the taper. Ensure the holes are free of any residue. Drive the supplied 1/4" diameter mushroom head pin anchors (two each) into the holes with a hammer until the head is seated. - At all times, keep mat clear of snow, ice, dirt, leaves, and other debris that may accumulate on the surface. - Clean mat with mild soap and warm water. Rinse well and use extra caution when mat surface is wet. 2.5" x 24" x 48"
Thank you for reaching out to us. 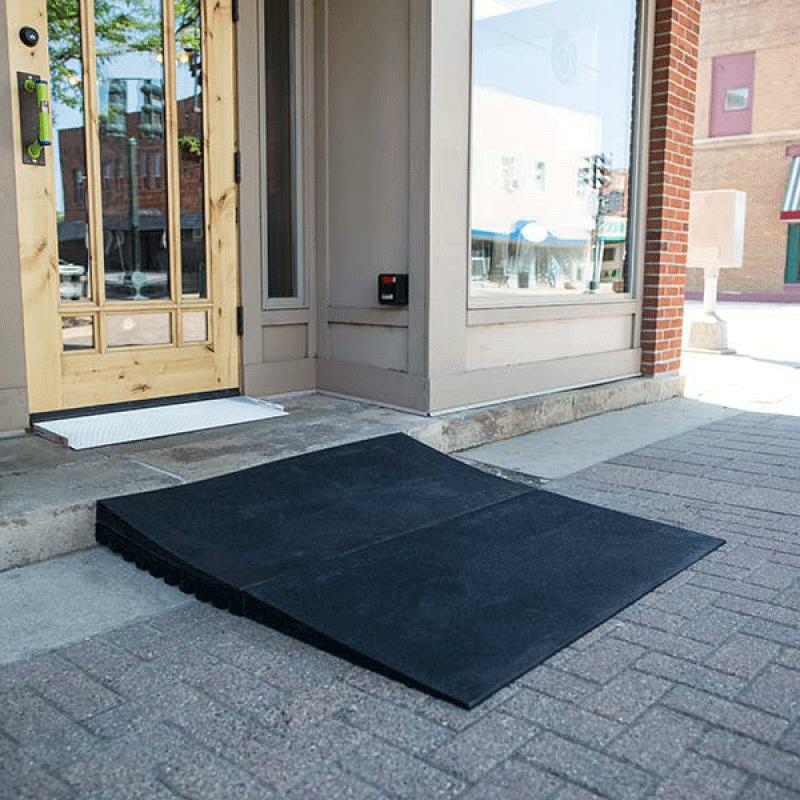 The Ez-Access Transitions Modular Rubber Threshold Ramp can be combined with Rubber risers to create a maximum height of 4-3/4 inches. Hope this answers your question.